I wanted to try making beetroot gnocchi. Most recipes I found on the internet seemed to be more about the color than the taste of beetroot, since only small quantities of beetroot were used. So I tried to make it with as much beetroot as possible and they turned out fine, but did not have a strong taste of beetroot. Perhaps it was the quality of the beetroots I used or perhaps I should try to use even more beetroot, but that will be pushing it in terms of making sure that the gnocchi will not disintegrate during cooking. So I’ll try again but since it wasn’t bad at all I’m sharing the recipe with you anyway. Note April 3, 2012: my second attempt turned out much better. 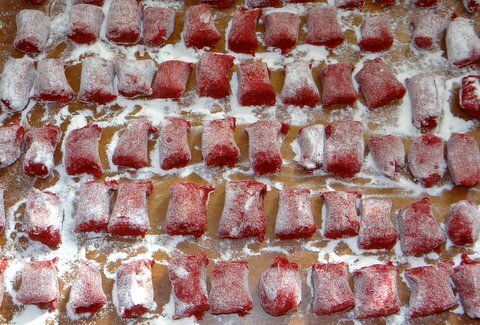 So if you’d like to make your own beetroot gnocchi, check out my successful recipe! I cooked the beetroots for 90 minutes and the potatoes for 60 minutes in the oven at 200C/390F. Then I peeled both while they were still warm. I pureed the beetroot in a blender. Then I let the beetroot simmer in a non-stick pan for 10 minutes to remove moisture and concentrate the flavor. 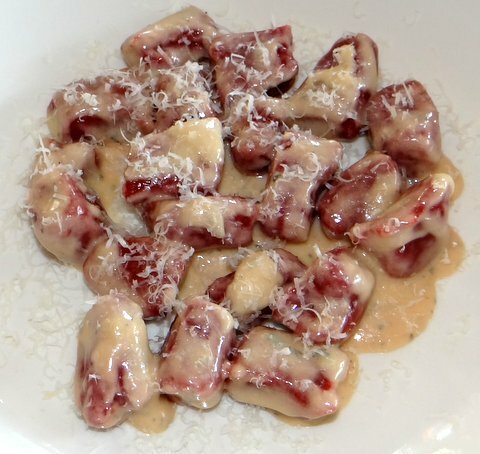 Then I made a dough using the beetroot puree, mashed potatoes, flour and some salt and proceeded to make gnocchi just like ordinary potato gnocchi. I made a cream and blue cheese sauce by melting the butter, adding the cream and bringing it to a simmer and then letting the blue cheese melt. I cooked the gnocchi in boiling salted water until they started to float and then tossed them with the blue cheese sauce. It tasted fine, but apart from the color it was difficult to tell it was beetroot and that was not my point.